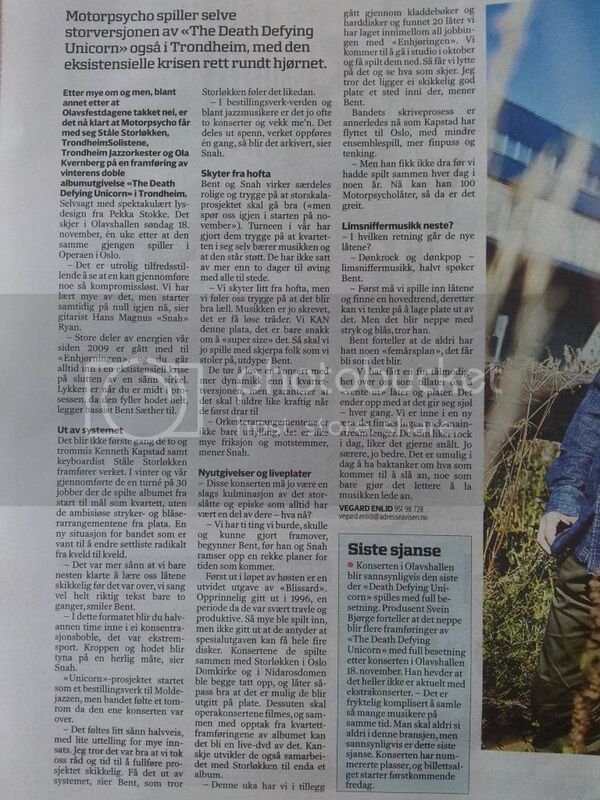 I read in the paper Addressa today - there will be a third TDDU concert, on November 18 - in Olavshallen, the Trondheim concert hall. Tickets will be on sale this Friday (they are usually available on http://www.billettservice.no). - The Adressa article also mentioned some news about releases, the most concrete was an expanded version of Blissard on "up to 4 discs" in the works. - The Cathedral concerts was recorded and sounds good, so may be released. - The TDDU concerts in the Opera will be filmed, for possible release. - They have more stuff created with StÃ¥le StorlÃ¸kken, will record in October to see what comes out of it. I'll post the link if the article is published in the web edition. wohoooow, very exciting news (releases)! Oo, supersize Blissard? Sounds interesting. Also: any of you moustacheclad Adressa-readers up for a scan? * The gigs in Nidarosdomen and Oslo domkirke were recorded, sound great and might be released. Regarding the expanded Blissard: If I remember correctly, they recorded almost an entire (and mostly unreleased) album together with Deathprod at Kunstakademiet in Trondheim in the Blissard period, I believe "Mad Sun" and "Wishing Well" stem from those sessions? I for one hope all that stuff will be released on the expanded Blissard! 4 disc Blissard - GREAT! Wow, 'Wishing Well'... one of my favourite Songs. I might again become a fan after all. "recorded fall '94 at KiT (the art acadamy i Trondheim) along with other songs,of which only 'Mad Sun' have been released from this session. The closest we've come to a 'lost album', the other songs tried were : Stalemate,7th dream,Flick of the wrist,When the world sleeps (later cannibalized and used as the intro to 'in the family') & Black w'abbit (by the Alabama Kids).